As a builder, you work in a highly competitive market. Therefore, it is important that you pull out all the stops in an effort to entice buyers. Among the many different tools at your disposal, a model home works incredibly well. After all, a lot of people are visual, meaning they can only imagine what a house would look like if they see it filled with furnishings. Therefore, when building a model home in Nashville, consider decorative concrete entryways that grab peoples’ attention the minute they walk inside. For this, you have multiple possibilities, including a hand-troweled custom design created by an artisan and an architectural micro-topping that creates a stunning marbled effect. For the first example, a product called Tuscan will surpass all your expectations. With textured high and low areas, the surface looks stunning. Also, you can select from different coloring options such as a clear finish, colored stain, oxides, and acrylic finishes. Because this particular solution is thinner than most stamped overlays on the market, it yields a stunning look that people remember. For concrete entryways in your Nashville model homes, this flooring system deserves serious attention. However, an architectural micro-topping makes just as powerful of a statement when used for concrete entryways in the model homes you have in Nashville. Along with durability, what makes this an excellent choice is its versatility. In fact, by selecting a different color or coloring system, you could use a product like SunCanvas for all your properties yet achieve a unique look for the different floor plans. By installing decorative concrete entryways in your Nashville model homes, you provide potential buyers with a vision of what their home could look like. This also allows you to showcase the different possibilities, allowing them to select the flooring system they like best. Because other builders vie for your same customers, you need to think outside of the box when it comes to beautiful design elements. While hard to believe, this bitterly cold winter is almost over. With springtime just around the corner, now is the ideal time to start planning a new pool deck for the backyard of your Nashville home. Whether you have ideas of your own or want to spend time scouring the internet for inspiration, make sure you select a qualified installer or contractor for the job. Also, that individual should use only the best products available, including the popular Classic Texture. For one thing, you want to consider who typically uses the pool. Why does that matter? Well, if you have children or family and friends with kids who visit often to swim, it is imperative that you select a pool deck for your Nashville home with a slip-resistant and cool-to-the-touch surface. That dramatically reduces the risk of someone falling and sustaining an injury or burning the bottoms of their feet. Even the frequency of using the pool matters. Whether for fitness or recreation, you should consider a pool deck that will last as long as your Nashville home. Having a surface that wears extremely well and lasts year after year decreases the amount of work you put in on maintenance. Also, if you ever decide to put your house on the market, a beautiful pool and deck make a great selling point. Of course, you do not want to overlook the appearance factor. Although you have many different options, the benefit of an acrylic spray texture coating like the one mentioned is that you can customize it using color, as well as patterns and textures. Depending on the look that you ultimately decide on, a professional installer can create beautiful score lines, masonry effects, and even add aggregates to the formula. As part of planning the new pool deck for your Nashville home, you can also transform the appearance of your backyard patio or walkway. 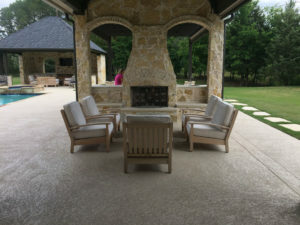 Using the same decorative concrete solution or something that compliments the decking, you end up with an outdoor living area that makes everyone envious. Have you ever made a decision only to regret it later? Most people have, which is both frustrating and costly. Especially when you are looking to hire a concrete contractor in Nashville to work on your pool deck, before signing on the dotted line, you want to feel 100 percent confident that you chose the right person for the project. The key is to look for four specific signs that you selected the right concrete contractor in Nashville. Instead of having subpar work performed, you can relax knowing the individual you hired has both the experience and expertise required. Specialized Skill – While applying a decorative coating or finish might sound easy, it takes someone with specialized skills. Therefore, always ask for references, look at the portfolios of potential contractors, read online posts, and check out industry-related ratings. The goal is to select someone who has years of experience with pool deck transformations. Product Knowledge – It is important that you hire a concrete contractor in Nashville with extensive knowledge of top-of-the-line products like Classic Texture and SunColor. As the customer, you have every right to question the products your contractor uses. Customization – If you want a stamped concrete overlay applied to your pool deck but prefer something customized, you should only hire an expert with that capability. For this particular overlay, a lot of people use templates, which is fine. However, for a more personalized look, you need an expert qualified to provide the unique design effect you want. Licensed and Trained – Obviously, you only want to do business with a properly licensed and insured concrete contractor in Nashville. At the same time, it is to your advantage to choose someone who has also completed a significant amount of training. Because decorative concrete products, tools, and techniques change, that ensures the individual is on top of his game. For you, that equates to a superior finished project. The number one reason why people visit a bed and breakfast is to unwind and relax. If you own this type of business in or around the Nashville area and you want to do something special for your guests, consider beautiful stained concrete floors. Whether you go with an acid-based stain like SunAcid or a water-based product such as SunH20, the floors will look gorgeous and last for years. The great thing about stained concrete floors is you can give each guest room at your Nashville bed and breakfast its own personality and character. Even if you already have a charming place, this is an outstanding way to enhance the overall environment, which in turn, creates a more memorable experience for your guests. Along with the bedrooms, you can transform the look of other areas inside and outside. For instance, you can select from beautiful, warm colors that make the guestrooms feel inviting. Regardless if you go with Bronze, Cola, Terra Cotta, or one of the many other hues, new floors will change the entire atmosphere. Add in comfortable bedding, unique artwork, and gorgeous furniture, and you have yourself a winning combination. On the other hand, you could select water-based acid-stained concrete floors for the children’s play area and game room in your Nashville bed and breakfast. AS they are available in a much broader selection of concrete colors, including those with bright and fun tones, you have the opportunity to create spaces where your guests love to hang out. You can also add personality to other rooms, like the dining area, kitchen, bathrooms, laundry room, library, and so on. Both stain options provide endless possibilities. Along with gorgeous colors, an expert can create unique design effects and include aggregates in the formula. The decision to go with stained concrete floors is an excellent way to entice people to stay at your bed and breakfast in Nashville rather than somewhere else. Your Nashville hair salon may be a place where customers come for new hairstyles, coloring, perms, straightening, and more, but it is also a business that deals with a lot of chemicals and foot traffic and needs ongoing cleanup. For your part, decorative concrete floors will eliminate a lot of work while still providing your clientele with a safe and relaxing place to have their hair done. For the concrete floors in your Nashville hair salon, you can select solutions on both ends of the spectrum. That means you can have a professional installer create a pattern that mimics other materials, like wood, brick, rock, slate, and so on, using a template. In this case, a top-of-the-line product like SunStamp achieves optimum results. The other possibility entails having an artisan hand-trowel a coating using a superior product like Tuscan. As a handcrafted overlay, the outcome will surpass your expectations. Although these two options produce different results, they can both transform the concrete floors in your Nashville business. Competition – In a fiercely competitive industry, gorgeous floors give you a leg up on the competition. In your salon, customers enjoy a full spa-like experience consisting of comfort, relaxation, and tranquility. Versatility – With endless colors, patterns, and textures, you can transform the concrete floors in your Nashville hair salon in any way that you want. Durability – Decorative concrete floors are highly durable. As such, they easily handle heavy foot traffic. Customization – Color, patterns, textures, and aggregates allow you to customize the look of your floors. Long-Lasting – When professionally applied, a top product will provide you with floors that remain beautiful for a long time. Resistance – When sealed for added protection, both stamped and hand-troweled decorative coatings offer resistance to chemicals, oil, water, abrasion, impact, and stains, all potential risks associated with your hair salon in Nashville. Enjoy concrete floors that look fantastic yet hold up to almost anything.